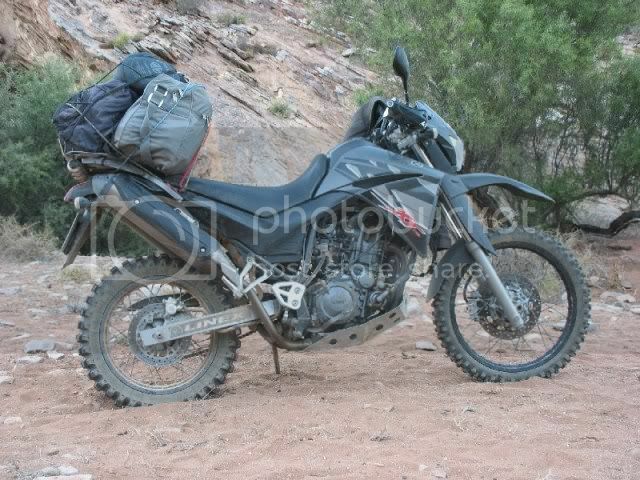 Pics of your LOADED bike for the long trip. Im not sure if a thread like this existed somewere and i am most probably the wrong person to start it. 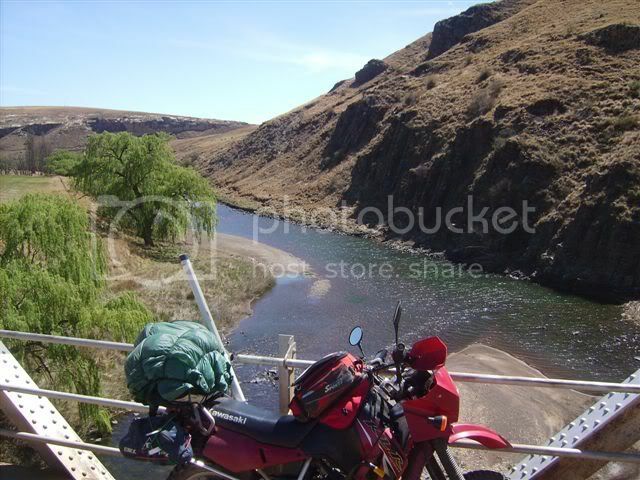 here is my bike ready for a two night trip... but this is pretty much what it looked like on a 12 day Namibia trip too. the only thing missing is a proper toolkit... but i have found a special place for that.. .but its a secret until i perfected it. semi unloaded... you can see my backpack here. 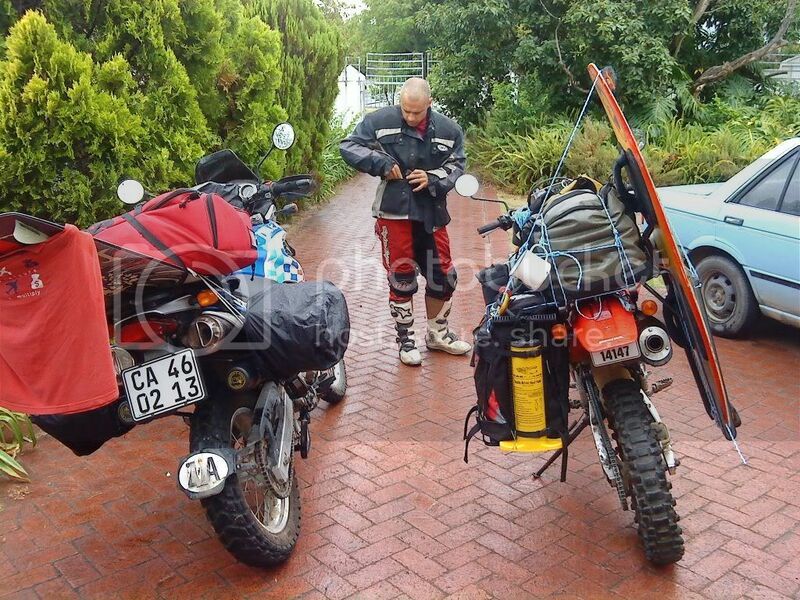 Re: Pics of your LOADED bike for the long trip. Loaded and almost there... it did look dirtier when I reached Hoggies. OK, maybe a bit of an overload but the pooratech rain protection makes everything look a bit worse and more bulky. Will look for and upload something without the protection later. Trailblazer, that is impressive for 21 days. Included in the one pannier was my laptop as well. I washed jocks and socks every night, and tied them to the tog-bag on the pillion to blow dry while riding. I also had laundry done if I stayed over longer than 1 day in any place. Right side was mattress pump, gas stove, gas lamp, army dixie to cook in, coffee mug, coffee/condensed milk/weet-bix, matches, soup, noodles, other small assorted snacks etc. Tankbag had water bottle, camera and assorted quick snacks (chocolate / biltong / dry wors). Can't remember what was in the tog-bag, other than a centre stand that I made up just before leaving home. Had a need for the centre stand because i travelled solo, and didn't want to battle if I had a flat along the way. Fortunately I didn't need to use it, and donated it to Trailrider after I got back home. Which reminds me... I'd better make another one to take with me to the Limpopo Bash. my dads pack... ill ask him for a more descriptive pic. Fishing rods in pipe. My little brother. Packed and ready to leave... with full kitesurfing gear loaded. 3 month tour through Vietnam and Tailand. Now that I see some of the others mine seems lightly loaded... but then again I am not into camping anymore... did enough while working for Uncle PW thanks... I prefer B&B's and the nearest steak house.